In the space of just one week, both Lewis Hamilton and Sebastian Vettel felt the weight of home defeats, the British driver recovering from last to second place in Silverstone, where the Ferrari driver won comfortably, and then with Vettel crashing out of the lead at the German Grand Prix, to hand his championship rival an unlikely victory, after he started the race from just 14th place on the grid. Looking on the surface at both results, they seem identical, also because Hamilton was by far the fastest driver in the Silverstone race and Vettel was comfortably leading in Hockenheim, after setting a spectacular new track record in qualifying. But their respective feelings after those home losses and the long-term effects they might get are quite different. While both were bitterly disappointed at the end of their home Grand Prix, it was clear Lewis Hamilton left Silverstone with a feeling of injustice, knowing he had lost a race he should have won, for he was the fastest driver in the field and had dropped to last place three corners into the race through no fault of his own - after all, he was hit by Kimi Raikkonen and was the innocent victim of somebody else's mistake. Vettel, on the other hand, left Hockenheim with just himself to blame for the mistake that took him out of the lead on lap 52 of the German Grand Prix. The Ferrari driver had led from the start, steadily increasing his advantage over Valtteri Bottas and by virtue of changing tyres earlier than the Finn had extended his gap from six to nine seconds going into the second part of the race. The first signs that Vettel was not as comfortable as he might have been came from his radio messages when he found himself stuck behind early stopper Kimi Raikkonen. Used to seeing the Finn open the door every time they had found themselves in that position, Vettel was audibly upset that he had to follow his team mate for 13 long laps, damaging his front tyres in the process, and allowing the two Mercedes drivers to close the gap to both red cars. Then came the light drizzle that transformed the race. Initially Vettel pulled away from Raikkonen but when Bottas passed the veteran Finn it was clear both Hamilton - on softer and much fresher tyres - and him were quicker than the two Ferrari. Trying to keep a comfortable lead, Vettel misjudged the conditions going into the Sasche Kurve - one of the few corners in Hockenheim with just a gravel trap on the run off area - went off and hit the wall hard enough to retire on the spot. Just like Hamilton's post-race body language in Silverstone, Vettel's reaction as he left his stranded SF71H said all you needed to know about his mood. While the Brit was visibly upset, almost enraged, after losing a race he felt he should have won, the Ferrari driver was just frustrated with himself and dejected with his own mistake. None of them was keen to speak publicly after their defeats, Hamilton skipping the post-race interview to be eventually caught by Martin Brundle on the Silverstone podium, where, still livid with the afternoon's events, he made a poorly judged accusation towards Ferrari, repeated minutes later in the FIA press conference. A couple of hours later, visibly cooler, he started to backpedal on his accusations, taking to social media the next day to admit he'd overreacted in the heat of the moment. 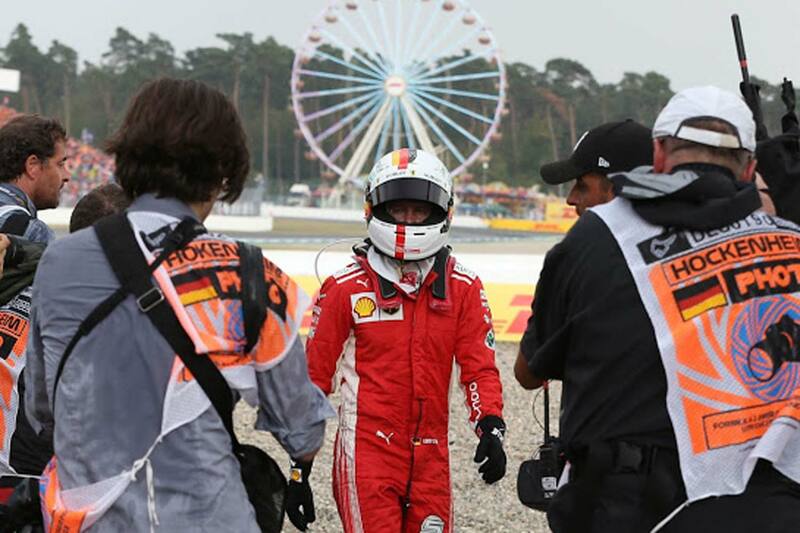 There was no escape from the TV interviews for Vettel in Hockenheim, though, and he candidly admitted it was his mistake, but insisted, "it was a small mistake but the consequences were big." He insisted he wasn't going to lose any sleep on Sunday night in spite of his mistake, but his body language suggested otherwise. And he left the track without speaking to the print media, never a sign of someone at ease with himself. As much as Hamilton had been furious in Silverstone, feeling he had been the victim of a terrible injustice, Vettel was downcast in Hockenheim, knowing he had only himself to blame. How the German reacts next week in Hungary may set the tone for the remainder of this championship. Hamilton arrived in Germany fully pumped to show his strength and even the hydraulic failure that forced him out of qualifying and to start from 14th on the grid didn't take his motivation away. He may have looked like a broken man as he got out of his stranded W09 at the end of Q1, but within minutes he was vowing, "never to give up. I know it won't be easy to comeback through the field, this is one of the tracks where overtaking is most difficult, but I believe I can still win, I believe in myself and I believe in my team." And that clearly showed on Sunday. It will now be Vettel's turn to show he can comeback strong from disappointment and with the advantage of having only a few days to get back into the car, while his rival had to wait for eleven days before getting back to business. There is no reason to doubt the German will get to Budapest in top form, highly motivated and at the top of his game, but will the Hockenheim mistake be in the back of his mind? His critics have been quick to point out he also made mistakes in Baku - overshooting into Turn One while trying to pass Bottas for the lead - as well as in France, where he rammed the young Finn right after the start, adding his blocking of Carlos Sainz in Austria, in practice, that led to a grid penalty. So, the pressure will be on for the Ferrari driver, especially on a track where Ferrari should have the upper hand over Mercedes and where Red Bull should be its biggest threat. Effectively Vettel will be on a mission at the Hungaroring, determined to win to erase his German Grand Prix mistake from Formula One's collective memory, while Hamilton, knowing he'll probably have just the third quickest car around that track, will be in "damage control mode". With such different frames of mind at play, let's hope we're on for another cracking race at the twisty Magyar track.